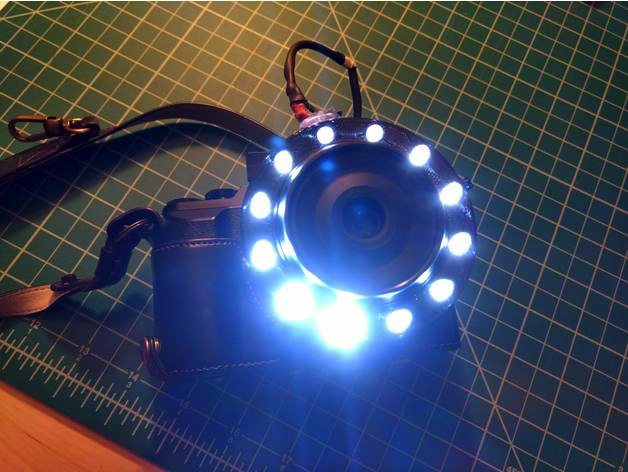 #3DPrinted Macro LED Ring Light #celebratephotography « Adafruit Industries – Makers, hackers, artists, designers and engineers! I created an LED Ring Light for macro photography. This press fits on to the Olympus 30mm Macro Micro4/3 lens. It is meant to add light for close up photos where a flash won’t reach. Using one, you can take photos at night like the flower shown above or just add more light. Adding more light is helpful so you can lower the ISO for less noisy images, or raise shutter speed to allow for hand held shots in lower light, or stop down the aperture to get more in focus. The light also helps to reduce shadows. The ring has an inner diameter of 55.2mm which is just large enough to fit on the metal ring at the end of the lens. The battery fits in a small case that mounts to the hotshoe flash mount on top of the camera.